Vinyl flooring is a very durable and versatile flooring option known for its resiliency that is available in a wide variety of styles, patterns, and colors. Art Z Flooring, a leading provider of flooring installation services in the Chicago area, provides installation services for new vinyl floors in any area of the house. Our professional staff can help you choose a vinyl floor that best matches the décor of your home and manage the entire installation process from start to finish. Vinyl flooring has a lot of versatility in color and design options and can come in styles that mimic stone, wood, and ceramic. Regardless of the style, vinyl floors are generally installed as sheet, tile, or plank. Sheet: Sheet vinyl is available in 6 or 12 foot widths that are either cut to the measurements of a room or packaged in prepared rolls. This vinyl type is great for areas with high moisture such as the kitchen or bathroom because the sheets can be installed seamlessly. Tile: Vinyl tiles are made to exact dimensions and thickness in either 12 or 18 inch squares to create a uniform appearance on the floor. They are available in a variety of patterns and colors and they are easy to install, especially self-adhesive tiles. If the tiles are cut to precision, they are easy to replace if one becomes damaged. Plank: Vinyl planks are typically four to six inches wide by three to four feet long and are made to mimic the look of hardwood. They are easier to install and maintain and much less expensive than actual hardwood. Laminate floors consist of planks, squares, or tiles that lock together with a tongue and groove configuration. Some laminate floors may require a type of glue or adhesive for assembly but most types do not. All laminate flooring types do, however, require an underlayment so that it floats above the sub floor and some types come with an underlayment attached. This floating method does not attach the laminate floor to the sub floor, the flooring is held in place by molding. Versatility: Vinyl floors can be installed over virtually any underlayment, concrete, old ceramic tile, and wood or non-cushioned vinyl flooring. They also come in an array of styles, colors, and patterns to create a variety of different looks. Low Maintenance: Vinyl floors are resistant to stains and only require regular sweeping and occasional damp mopping to stay clean. Spills can be cleaned up effectively with a damp cloth. Durability: Vinyl floors are very resilient and resistant to scratches and dents. With the proper maintenance they can last for a long time. Water Resistance: Vinyl floors are highly resistant to water which makes them an ideal choice for high moisture areas such as the kitchen or bathroom. Vinyl No-Wax: Ideal for areas with low traffic and minimal dirt exposure. Urethane: Suitable for areas with normal to heavy foot traffic; also resistant to scuff marks and scratches and it is easy to clean. Enhanced Urethane: This is the highest quality wearlayer and can handle the heaviest foot traffic. It is also stain and scratch resistant and lasts much longer than the other coatings. Inlaid: The vinyl is embedded with color granules for a strong finish. Printed: The colors and patterns are literally printed in ink onto the face of the vinyl. Art Z Flooring is a trusted provider of flooring installation services in the Chicago area and we carry and install vinyl flooring. 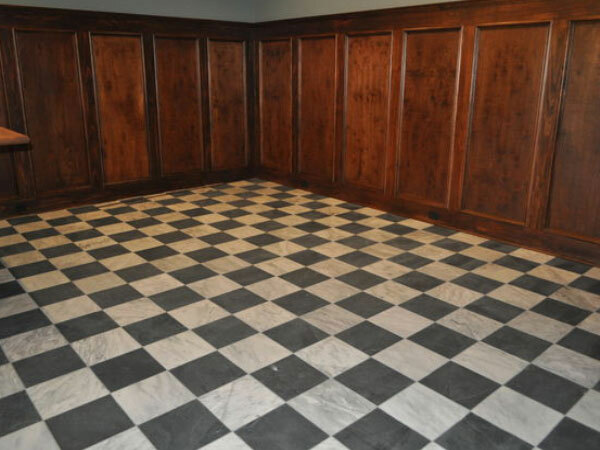 Contact us to learn more about vinyl flooring options and our installation services.